Computer use adds even more sedentary “screen time” to the daily lives of children who are getting too much of it already, watching TV and videos. When physical activity – running, jumping, climbing – is replaced by sitting, there are negative consequences to both motor development and overall health. Childhood obesity rates are skyrocketing. Although some computer software can offer engaging learning opportunities, even the best games can’t replicate the rich experience of using all five senses while playing with real objects and toys, much less the limitless possibilities of a child’s imagination to “create” play scenarios with these props. The development of social skills that happens naturally during free play among children is lost when a child sits alone using a computer. Keeping the above in mind, how should parents of a preschooler who loves to play computer games oversee the experience? Moderation and monitoring are the keys to protecting a child, and ensuring he or she gets the best of what’s available. Choose high quality software designed specifically for young children. 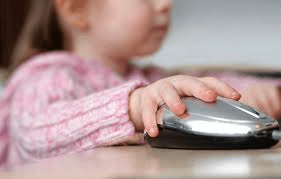 Computer use by preschoolers should be about playing, exploring and experimenting. Avoid software with a “drill and practice” approach to skill building, which has been shown to decrease children’s creativity and motivation. Many public libraries on Long Island have children’s software to borrow from their collections, so you can preview software to assess quality before purchasing for your own collection. Use the computer with your preschooler. Teaching a child how to navigate a software program successfully can limit frustration, and observing how your child uses the software will provide you with insight into how he or she thinks. The computer can be a great tool for answering questions from curious preschoolers. Type “Why is the sky blue?” into a search engine to bring up simple scientific answers that will enhance your child’s understanding of such topics, and kick off a great dialogue between you and your son or daughter. Encourage children to work in pairs at the computer. Unlike adults, children treat computer time as a social opportunity. Putting their heads together to problem-solve and practice negotiation skills as they maneuver through a software program, they gain more from the technology when they collaborate. Paired use of a computer by siblings encourages them to cooperate and results in less fighting over computer time. For a child who is shy by nature, sharing the computer with a friend can provide the kind of mediated play that allows him or her to build social competence, especially if that child feels less skilled in other, direct forms of play. Set limits on the amount of time your children spend in front of all screens (computer monitors, TVs, hand held and play station games). No young child should spend more than one or two hours a day, combined, in front of screens. If a preschooler goes beyond that outer limit, he or she is probably missing out on another important activity. There are only so many hours in the day, and parents must think about what their children are NOT doing when their eyes are fixed on a screen. Helping mom or dad make dinner, building a castle out of a cardboard box with a friend, or romping outside with the dog should never be sacrificed to more time at the computer. Nancy Olsen-Harbich is Program Director and a Human Development Specialist with Cornell Cooperative Extension of Suffolk County’s Family Health and Wellness Program. She can be reached at 631-727-7850 ext. 332 or at no18@cornell.edu.